There are two main factors that act as inhibitors as companies work toward the consumerization of the enterprise. Commoditization of IT and Offshoring and Existing Process/structure. Although the enterprise may be moving toward consumerization, certain factors act as inhibitors as companies attempt to evolve as well. Chief among them is the commoditization of IT and offshoring. What we hear from analysts and see in our experiences is that corporate IT organizations are not structured in ways that are highly conducive to the idea of being user-centric and consumer-oriented. Many organizations have embraced the concept that IT is a commodity, and therefore, the focus should be on lowest cost offshore bodies. There may be a role for offshore development at low cost, but it is not likely to be focused on building the user experience that is going to re-invigorate the business service provider-customer relationship. It is unrealistic to expect that sending a 100-page MS Word document to the other side of the planet will result in an engaging experience after several months. Creating a meaningful user experience is a collaborative and iterative process. There is an important point on which to set the record straight. IT procurement organizations remain stuck in the early 2000s, after the dot-com bubble burst, when the market faced a glut of IT resources. This oversupply resulted in a flight from IT-oriented careers. The number of IT majors was cut almost in half between 2002 and 2006, from 23,000 to 13,000 in just four years. As the market demand for IT resources has increased over the past few years the supply has not kept pace. In addition, there is a phenomenon that is all too prevalent in IT procurement organizations. The commodity mindset of IT resources has caused procurement to focus on buying IT services as if they were buying toilet paper. The problem is all IT resources are not the same. Numerous studies have shown that in a typical development project most of the work gets done by about 20-30% of the team. In one project with 30 developers, data collected showed that six developers were doing over 90% of the work on the project. In addition, only one of those six was doing 40% of the project’s work on her own. The other 80% of the developers were net distractors slowing down the 20% who were doing the work. * (For more on this topic, see Grady Booche’s Managing The Object Orient Project, p. 189. See also PeopleWare by Tom DeMarco and Timothy Lister, p. 48). This phenomenon is exacerbated by the fact that when organizations go offshore they think that since labor is low cost and perhaps not the highest quality, they will compensate by hiring more workers to get the job done. Now, however, a large group requires a good deal of additional management, and the two or three stars probably have their hands full keeping the rest of the workforce from driving the project into the ground. Add to that the high turnover with offshore development firms, the language barriers, and the inherent difficulties of working with people on the opposite side of the planet—such as time zones and team building—and this is a model that has its challenges when it comes to creating a compelling user experience. The offshore model can be a recipe for disaster for organizations trying to collaboratively reinvent the customer experience and engagement model for what could be the most-used channel for interactions. Many enterprises don’t have processes or structure built around a user-centric IT delivery approach. A basic understanding of the user experience and its delivery tends to be the furthest most enterprises have gone, and many have no capability at all. This new and evolving area has really grown up significantly in the Web era. This space has rapidly evolved in the past few years and even a solid Web 1.0 experience design process is not quite adequate anymore. This young field went through a significant evolution with the advent of rich Internet applications (RIA). Prior to RIA, it was reasonable to leverage a fairly serial process of creating page schematics (wireframes) and then applying visual design to them; then the project would be handed off to an HTML resource, who would then bring it to life and provide this light front end to the J2EE or .Net development team. With RIA, this serial approach is antiquated and significantly less effective. As interactions become more cinematic, the motion of page elements communicates information and guides the user to the next action. 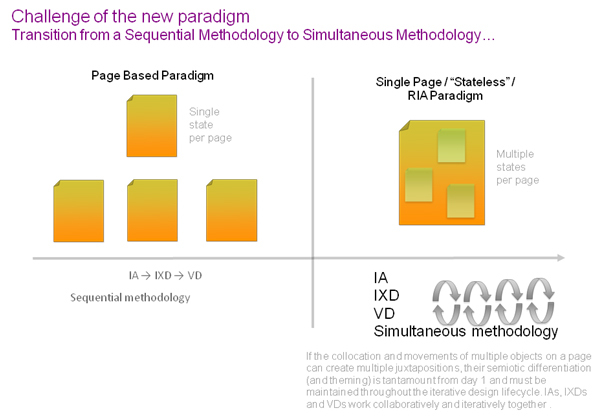 These interactions blur the line between the role of an information architect—who lays out the page and page flow—with the visual designer—who, instead of just coloring the page, is now integrally involved with leveraging the creative page elements to communicate action and flow (see Figure 6). 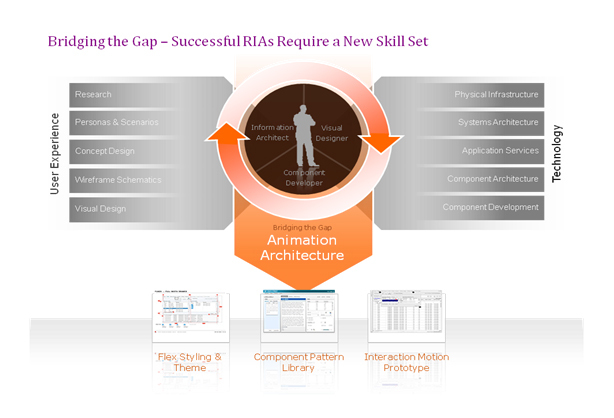 As RIA technologies continue to mature and evolve, there is a powerful give and take between the technologist and the design team. The technologies don’t just bound the design by what is technically feasible, but also push the design further by introducing capabilities that the design team never dreamed possible. This process has been reinforced by the emergence of Agile Design and Development methodologies. It is not necessary to fully embrace the Agile nirvana to gain the benefits of key Agile ideas, such as multiple spirals throughout a development cycle. In such an instance, incremental capabilities emerge early in the process, providing business users an opportunity to interact with the solution and provide feedback along the way. A key shift has been the importance of conceptual designs to communicate the direction early in a project’s life cycle. These concepts help to crystallize business intent, provide something tangible to test with users, and as importantly, can be utilized to help secure buy-in and project funding. These are frequently manifested in a Flash prototype but can also exist in a series of design comps and accompanying documentation. Many organizations lack an understanding of the new design and development processes necessary to producing rich and engaging experiences. They also lack the specialized skill sets and resources to deliver on these methodologies. We have seen the emergence of whole new roles that did not previously exist, but are keys to project success, such as the Flex Styler. This is a role similar to an HTML/CSS resource but requires additional skills with graphics modifications, animation and Action Script (the language of Flash/Flex). These resources are key to bridging the gap between a user experience design and the object-oriented development team that makes an enterprise application come to life (see Figure 7). In the next post I will explore the future of the enterprise.